The following article was written by Kate Bonzon, who works for EDF and was one of the authors of a new scientific paper published in Marine Policy that analyzed the performance of 15 catch share programs in the US and Canada. She argues the data shows these programs met most of their goals, especially in the area of conservation, reduced discards, and increased revenue to harvesters. There was a shift in jobs from a larger number of part time jobs to a smaller number of full time jobs, which had varying social impacts depending on the fishery. 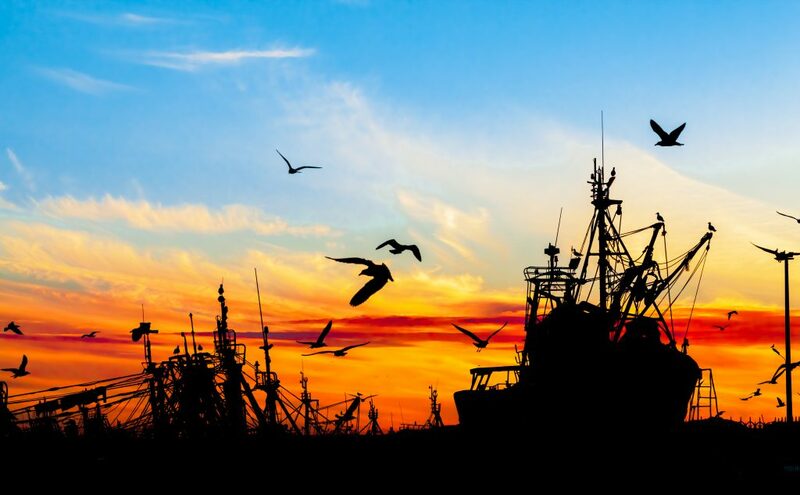 America’s fisheries, and the fishing communities they support, have struggled for decades to find a way to both rebuild depleted fish stocks and allow fishermen to earn a decent living. But it has become increasingly evident over the years that traditional management practices – such as drastically curtailing the fishing season – were failing to achieve either of these goals: fleets shrunk, revenues dropped, fishermen were often forced to put out to sea in bad weather, and the industry grew highly unstable. Fish stocks, meanwhile, continued to decline. The latest effort to achieve that balance – a management approach known as “catch shares,” has generated much discussion among fisheries stakeholders over whether this approach is any better or worse than previous efforts. Now, a recent analysis of 15 fisheries in the United States and British Columbia published in the journal Marine Policy, provides data that clearly show significant environmental and economic improvements in fisheries that have made the transition to catch shares, an approach that allocates fishermen a share of the total allowable catch in exchange for making them accountable for staying within the catch limit. 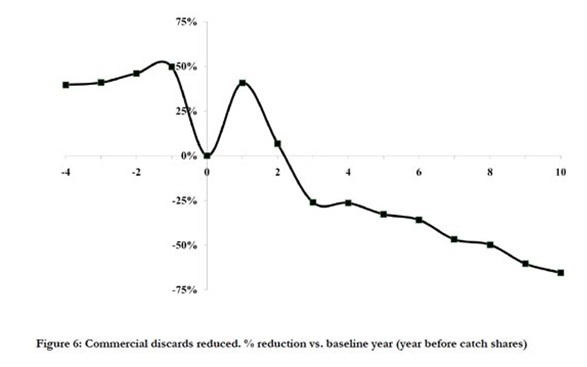 Discards declined substantially with catch share fisheries. Can a Change in Management Solve the World’s Most Pressing Marine Conservation Challenge and Foster Vibrant Coastal Communities? A new study published in the journal Marine Policy finds that reforming how fisheries are managed can successfully restore and maintain healthy fish populations and benefit both fishermen and fishing-dependent communities. The study evaluated 15 fisheries in the U.S. and British Columbia before and after adopting “catch shares” — a type of fishery management increasingly common worldwide. Catch shares, the study found, delivers “clear gains in environmental performance (and) major economic improvements” as well as dramatic improvements in safety for fishermen. The improvements were found across a range of fisheries in the Pacific, Atlantic and Gulf of Mexico and extended to fishermen from both small and large vessels, using a diversity of gears and targeting a variety of fish. In contrast, the study found that these same fisheries performed poorly under traditional fishery management in virtually all areas. 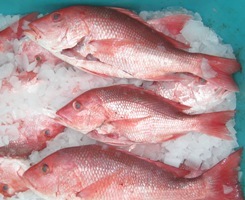 NOAA’s National Marine Fisheries Service recently released the Gulf of Mexico 2010 Red Snapper Individual Fishing Quota (IFQ) Annual Report, and it provides a wealth of data and information collected during the fourth year of the IFQ program. The report comes as the 5-year review of the IFQ is underway, and offers us a chance to use the latest data to evaluate the success of the program. By all counts, the IFQ has been a success. Back in 2006 when the Gulf Council was considering various management options in the red snapper fishery, fishermen had a short season each year, and had to go out even in dangerous conditions. The markets were flooded with fish for a short period of the year (and fishermen got low prices for their fish), and since the fishermen couldn’t decide when, where, or how to fish, they had excessive bycatch of red snapper and everything else. And to top it all off, they ended up going over quota anyway.